In the late 1700’s to the middle of the 1800’s, it was the custom that a Congregational Church must be established before the town could be incorporated. This is what happened in our town. In 1773 the General Court of Cambridge gave permission to establish a town. First, they must pick a spot to build a meetinghouse. They did and the General Court roughly laid out the plan for the town boundaries. From the spot, the land three miles into Worcester, Leicester, Oxford and one and one-half miles into Sutton would be the town land. It was called the Precinct of South Parish of Worcester. This lasted till 1778 when it was incorporated into the Town of Ward. In 1773 the building of the meetinghouse was begun. It was not completed until 1785. In the meantime, the Sabbath services were held in the Drury Tavern’s “Best Room.” The tavern was directly across the street from the new meetinghouse. Even after the meetinghouse was finish, there were times when the services were held in the tavern because there was not heat in the meetinghouse. The women of the church brought their foot-warmers on the cold days and some of the men brought their dogs to lie on the master’s feet. In time, stoves were erected in the church. It was on January 25, 1776, that the Church was organized with 23 members. The Sunday after the Declaration of Independence was printed it was read at all church services. At that time the meetinghouse was not completed so we believe it was read in the “Best Room” of the Drury Tavern. In 1784, Rev. Isaac Bailey became the church’s first pastor. His parsonage was across from the Common. He served the church for 30 years. Toward the end of his ministry, he was too ill to keep a tight rein on the congregation and with rum being plentiful at that time, the attendance dropped off and partying was the pastime. The Rev. Bailey’s salary was $300.00 annually and 25 cords of wood. The Rev. Bailey, his wife and their two children are buried in the old cemetery. In 1815 we obtained Rev. Enoch Pond as our second pastor. He was a pastor who preached sermons with plenty of Hell-Fire and Brimstone. In a short time, the members were back in the church and the membership grew. He resided at the house on the corner of Central and Church Street. He taught school there for seven years and after 13 years left our church and went to Boston to become editor of the “Spirit of the Pilgrims.” It was a religious magazine. While he was here, his wife, Wealthy, and four of their children died and were buried in the old cemetery. He married again, actually two more times and had 14 children. Four of his sons did become ministers. This was his only church. From Boston, he went to Bangor Seminary to teach and later became their president. He published many books, memoirs, sermons and articles for religious publications. While here, his salary was $400.00 per year. In 1824 a Religious Society was formed and it was responsibility was to raise moneys for the support of the Gospel and the paying of all expenses of the church. The Church’s responsibility was to provide the services and meeting the Pastoral needs of the Parishioners. Members could belong to both the Church and The First Religious Society at the same time. In 1828 Rev, Miner G. Pratt became our third minister and pastor. He served the church for 20 years. He was very active in town affairs. He was Postmaster of the town, a teacher and helped start the first Library. While he was here, he helped in changing the name of the town from Ward to Auburn. It was changed because there were times when the Ware and Ward mail got mixed up. While he was pastor, the meetinghouse was moved back from the street and turned around. Ten feet was added to its length, a steeple and belfry was added. A gallery was added to accommodate more pews and a room was built in the lower story for the Town Hall. Rev. Pratt served till 1848. His reason for leaving was that the Church could not afford to pay him to support him, his wife and nine children in the life style that he wanted. Between 1848 and 1851, we had no permanent ministers. In 1871, the church was remodeled. The galleries were removed and the floor was raised to give more headroom for the Town Hall. The members decided to insure the church building for $4,500 and the organ and furniture for $1,000. 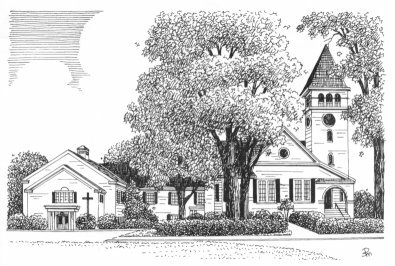 On December 13, 1889, the Church was incorporated and for the first time it was officially called the First Congregational Church of Auburn. In 1893 the Church and Town records were removed from the building and stored at the Mellish’s house. It was located where the Town Hall now stands. This was done so that a kitchen could be built for the ladies. On February 4, 1896 the Church was destroyed by a fire, It was started by accident when a Captain Norton, a Civil War Veteran, was setting up his equipment for a slide show for the following night to the members of the G.A.R. The fire did destroy everything. At that time there was no fire department and all they had was a hand pump on the Common. A Committee was appointed to raise money for a new church. They raised $5047 and the church had $5,500 from the insurance. The new church’s total cost was $10,497.58. On September 24, 1896 the cornerstone of the church was laid. The church was not completed till the following year. One hundred years later, on August 26, 1996 the cornerstone was removed from the church foundation, after four hours of difficult work. The copper box that measured 8 X 8 X 12 was removed from the granite block. After removing the solder, the cover was removed and we saw the thirty plus items that were stored away 100 years ago. They were in fine condition. After looking them over, they were locked in a safe place till we showed them to the church members and friends on September 24, 1996 at our Cornerstone Dinner Celebration. On November 2, 1997 the cornerstone, with over 90 items, was relaid. /One of the 1896 newspapers from the cornerstone was placed in the box with many pictures, letters and items from church members. The church was rededicated on March 2, 1997. Just one hundred years after the dedication on March 2, 1897. This service followed the March 2, 1897 service as close as possible. The hymn written 100 years ago for the dedication was sung and today’s counterparts of those who participated in the 1897 service were invited to take the same parts for the rededication. In the years 1955 and 1966 additions were built to the church building for classrooms, offices, kitchen, rest rooms and the Fellowship Hall. The historians have created the Abbie Wiley Room, with many treasures of our past. Since the beginning of this church in 1776, we have had 27 ministers, many interim ministers and assistant ministers.